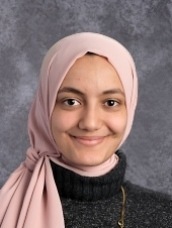 We are so very excited to welcome Ms. Widad Zenhom as English teacher on our AFA Middle School team! Ms. Widad is enthusiastic to return to Al Fatih Academy for the third year. She first fell in love with reading in her middle school years so she's excited to share that deep love of literature and leading her students to find their own voice this year. Ms. Widad brings creativity and passion for integrating language skills and life experiences to make English come alive! Her undergraduate degree is in Conflict Analysis and Resolution from George Mason University with a minor in Information Technology. This year she is starting her Master's Degree in Curriculum and Instruction at George Mason University. Ms. Widad’s passion is youth development and community engagement. For the past 10 years, she has worked with youth organizations to create programs, including as a writing tutor for middle, high school, and college students. Ms. Widad loves storytelling so you can often find her sharing her own or engaging in another's story through conversation, film, books, or photography.